These top quality backgammon sets come complete with everything for play. 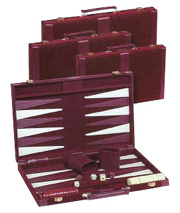 Our backgammon sets are in stock for immediate shipment. For more information, click on the links below or contact us toll free at 1-800-233-0828. 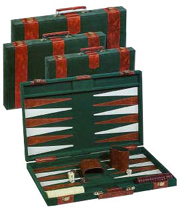 The Elegant Backgammon Sets - The Elegant Backgammon Set features a Velour exterior and interior. The playing field is coordinated with leatherette points, and the exterior has leatherette accents. All hardware is solid brass. This set includes two coordinated dice cups, checkers, dice, doubling dice, and an instruction booklet. Two sizes: 11" x 8" (#1821), 15" x 10" (#1823). Designer Backgammon Sets - The Designer Backgammon Set features a Velour exterior and interior. The playing field is coordinated with leatherette points, and the exterior has leatherette accents. All hardware is solid brass. This set includes two coordinated dice cups, checkers, dice, doubling dice, and an instruction booklet. You can choose maroon or blue velour. 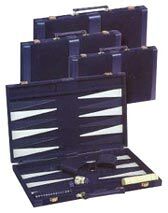 Three sizes: 11" x 8" (#1721), 15" x 10" (#1723), and 18" x 12" (#1725).